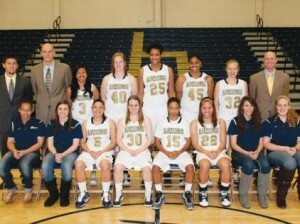 Michael Sampson--Newly crowned Golden State Athletic Conference champion women’s basketball team. 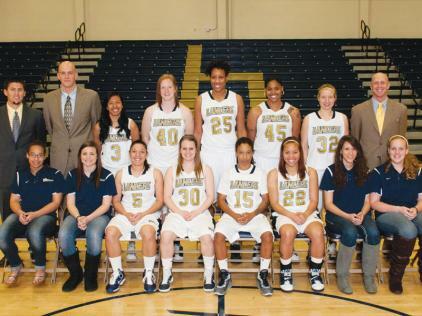 The 2010-2011 season has been a long journey for the California Baptist University Women’s Basketball team as they progressed from a losing record last season to winning the Golden State Athletic Conference. On Feb. 26 the lady Lancers took on Fresno Pacific University, and came away with a 93-56 win in their final game of the regular season. This win pushed their overall season record to 24- 7, a huge turnaround from last season’s 12-18 mark. The player worked hard, on the court and off. They played at a consistent high level throughout their journey towards the National Association for Intercollegiate Athletics tournament. One of the aspects which has contributed most to their successful season is the tight relationships that formed between the team members. S.J. Simmons joined the team later in the season but worked to keep a positive attitude and found a way to connect with the rest of her teammates. “At the beginning it seemed like it was going be a long road, but later when everyone started to connect with each other, we found a way to work well together,” Simmons said. According to Simmons, her personal goal for this season was to become a good all-around point guard and demonstrate a high level of sportsmanship. Simmons also mentioned team goals such as maintaining a high field goal percentage, averaging fifteen more rebounds than their opponents each game and keeping turnovers to a minimum. The game on Feb. 26 was also senior night. Senior forward Dana Olsen had an impressive game putting up 20 points for the eighth time this season, a mark she would hit again on March 5 during the Lancers 76-58 victory over Concordia in the GSAC tournament semifinals. This win secured CBU a spot in the GSAC tournament final for the first time in school history. Olsen has had a stellar senior season averaging 18 points and seven rebounds a game. She was also named conference player of the week in the beginning of January. She is the first CBU women’s basketball player to accomplish that since 2007. “This	season	the has become very close and progressed strongly,” Olsen said. Olsen’s hopes mirror the rest of her teammates, she hopes that the team can bring a title back to CBU. On March 7 they made CBU history as they won the first GSAC championship in the history of the program. They defeated Azusa Pacific 79-76, behind Brenna Hahn’s 22 points, to earn a number two seed in the NAIA national tournament. Tournament	play	begins March 16 and ends with the National Championship final on March 22.